A newcomer since I was last here, hopefully Pure Vegan is there to stay, as it is absolutely lovely. A peaceful and lush garden, friendly owners and waiting staff, carefully prepared and presented vegan menu with fresh, crunchy ingredients. There’s nothing not to love about this place, apart from the fact that it isn’t open often enough! 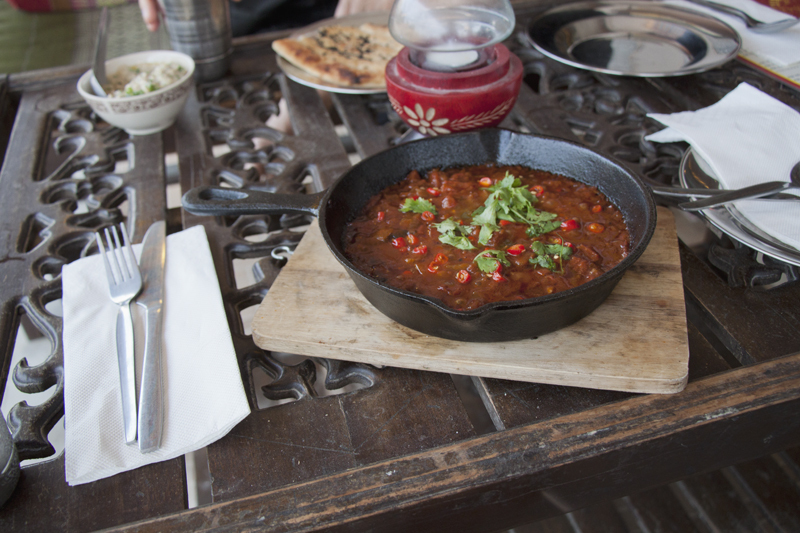 Pictured is the mushroom laarb, so yummy! Everything vegan, fare from all over the world including thali, teriyaki ‘chicken’, kebabs, scrambled tofu, pho, couscous, etc. I had the daily special: a mix of three delicious salads (the potato salad with dill especially tickled my fancy), dahl, a piece of chocolate cake and ginger lemonade all for 150B. Really really delicious! Nice shop with a few health products, cosmetics and jewelry. Fur a vegan brunch aficionado such as myself, Eat.co Bruncherie is literally heaven on earth. With things like smoothie bowls, breakfast towers, pancake waffle stacks, scramble tofu and all sorts of crunchy baguettes, wraps and savoury bowls, there little left here for your heart to desire after you’ve had a copious, gorgeous and healthy meal. Make this your point of entry and exit as you arrive or leave the island (it’s located right next to the ferry), and make sure you take something to go and visit often. 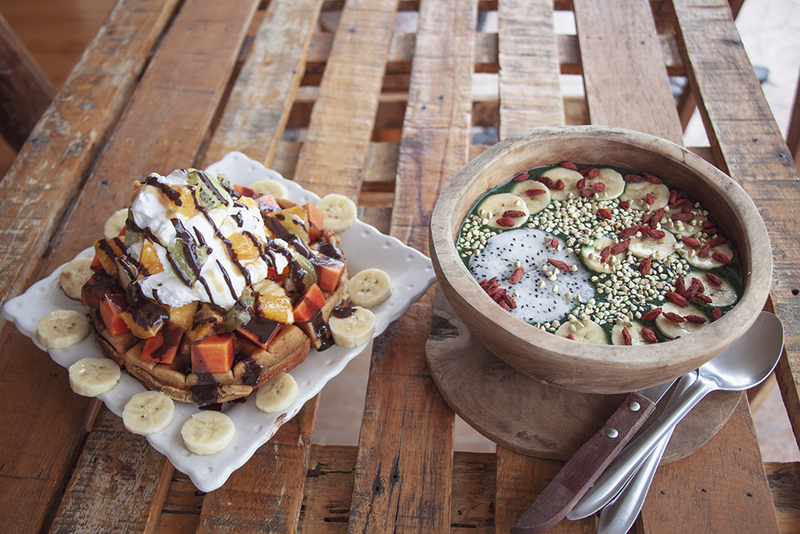 For something sweet, I recommend the waffles with fruits and coconut whip, they are amazing! If you’d rather something savoury, the scramble tofu baguette, served with pickles, homemade sauces and tortilla chips is where it’s at. 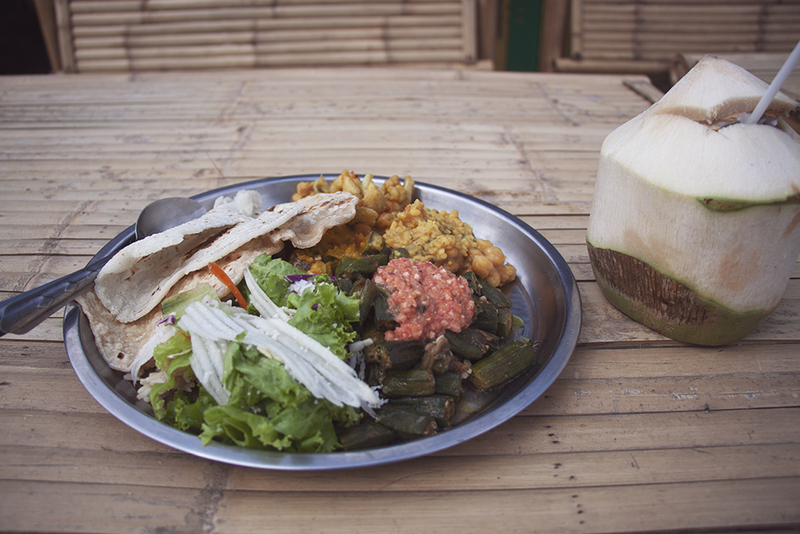 An all vegan restaurant located at the back of Panthip Market that serves amazingly healthy and fully vegan food. The breakfast menu contains delights such as creamy porridge with fruit, nuts and coconut milk, maca balancing smoothie, capana green smoothie and choko-moko protein smoothie. The specialties are the turmeric wraps, which are all made fresh to order (and by that I mean that the bread, the wrap itself, is made fresh to order – IT’S AMAZING) (I had the scrambled tofu avocado wrap) and all the salads came warmly recommended (I had the crunchy almond apple salad with sprouts). 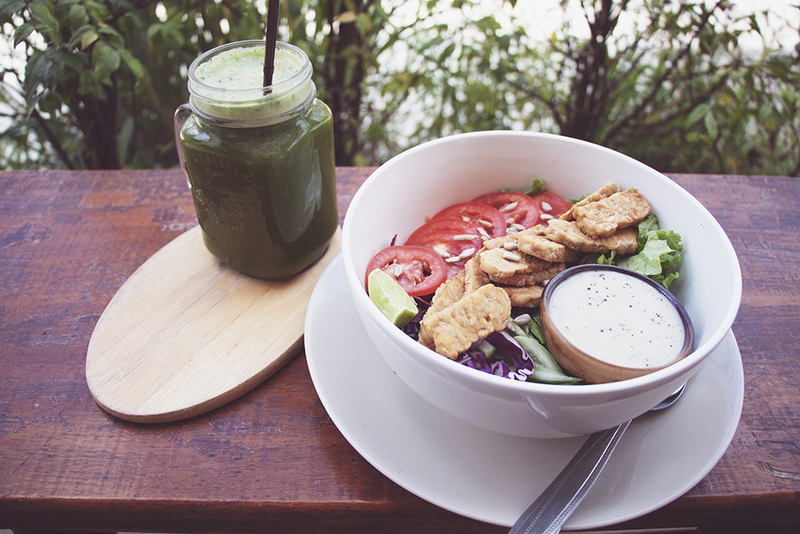 Get your fix of healthy food at good prices at this wonderful find! Several gluten-free options available. Great coffee. Quiet seating at back. Delicious healthy food in a peaceful setting by a small bay with beautiful views filled with equally beautiful and healthy-looking people. Vegan and raw vegan mostly Western menu that is prepared with great care and organic ingredients – as such the prices are understandably a little high compared with elsewhere. The juice and smoothie menu is filled with green concoctions that make me miss my blender dearly. Check out their detox programs and yoga schedule. Vegetarian cafe with a few clearly identified vegan dishes, extensive tea and coffee menu with several dairy and non-dairy milk options, lovely setting hidden amongst the trees. A peaceful little haven by the road side, Art Cafe has a short but lovely menu including delicious spring rolls, vegan BLT (I don’t know how they make their bacon, but it’s quite nice! ), soups and burgers. A nice restful pit stop. 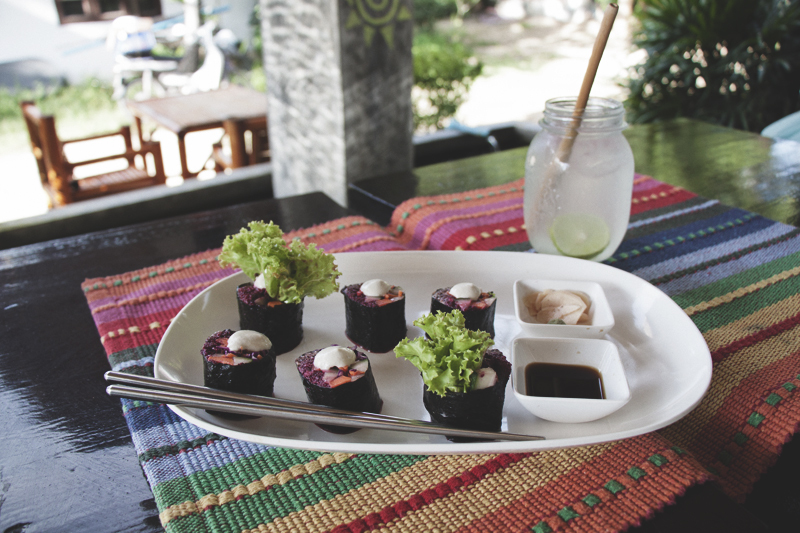 The Sanctuary restaurant caters to vegetarians, vegans, raw vegans and gluten intolerants with a few organic fish and seafood options thrown into the mix. 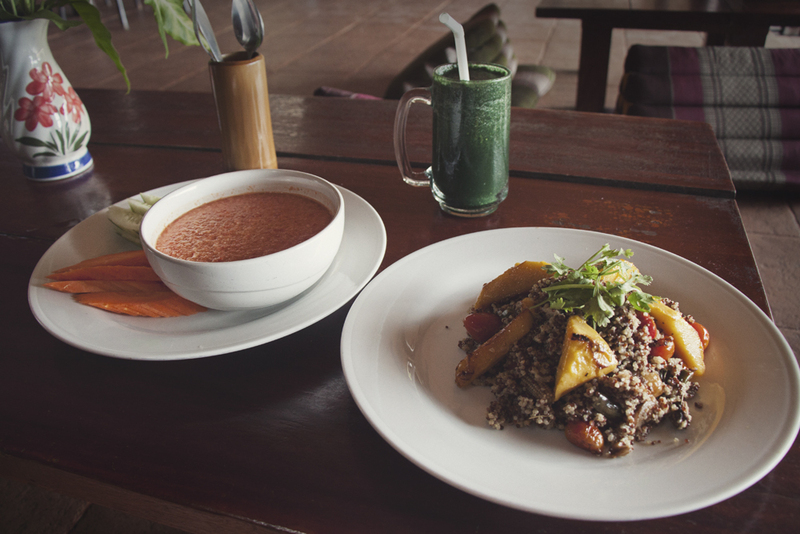 I ordered the grilled veggie and mango quinoa salad from the traditional menu, the raw coconut soup from the raw menu and a cucumber, lime and spirulina smoothie. 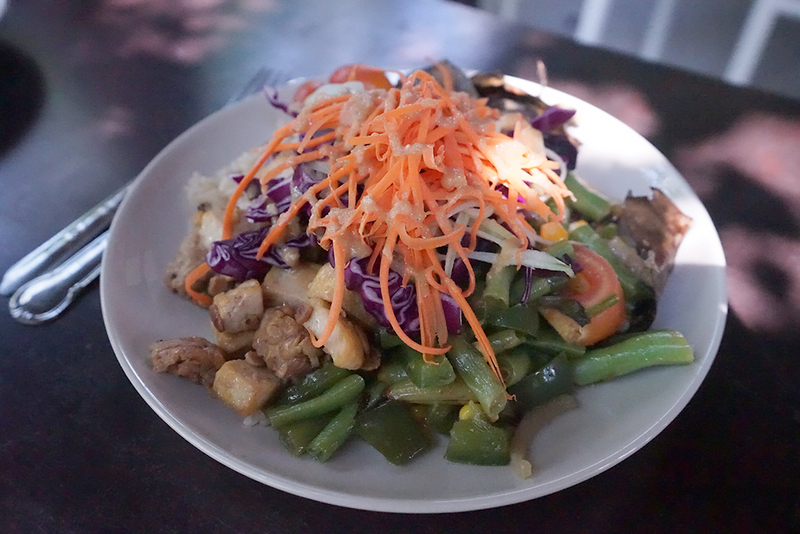 Other attractive menu items include hummus, cashew dips, wraps, veggie burgers, Indian fare such as the “Ganesh Special” (fresh veggies in Indian spice and coconut milk) and Thai specialties such as Khanom Gin (brown noodles with tempeh in a coconut sauce, topped with basil). A fully vegan restaurant with some raw and gluten free options as well. 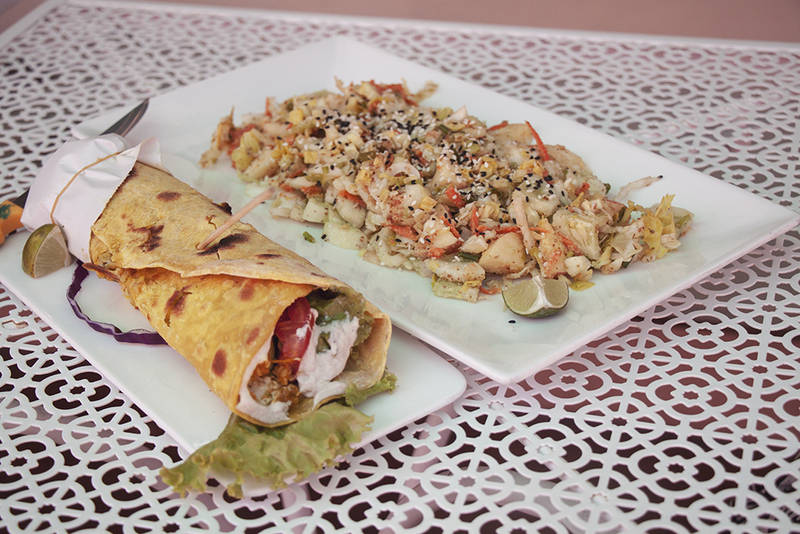 Rarities such as chickpea flour omelet, pancakes, vegan cheese, Moroccan stews, shish kebabs, pop-pies, English breakfast, tofu shakshuka, burekas, jahnun, blintzes, pastries and all your usual vegan fares such as salads, sandwiches, burgers and hummus plates. They also have a wonderful selection of green smoothies and cleansing juices as well as ginger and turmeric shots. All set in a lovely peaceful garden. Wonderful staff and owners. All vegetarian Israeli restaurant with a beautiful interior and friendly owners. Most dishes can be veganized. Choose from a selection of hummus and dips, shakshuka, sambusak, salads and wonderfully fresh pita breads. I had the spicy shakshuka with no egg (really just a spicy tomato dip!) with pita and babaganoush and it was heavenly. A colorful and fresh all-you-can-eat vegan buffet, full of veggies and deliciously crunchy and fresh healthy things. 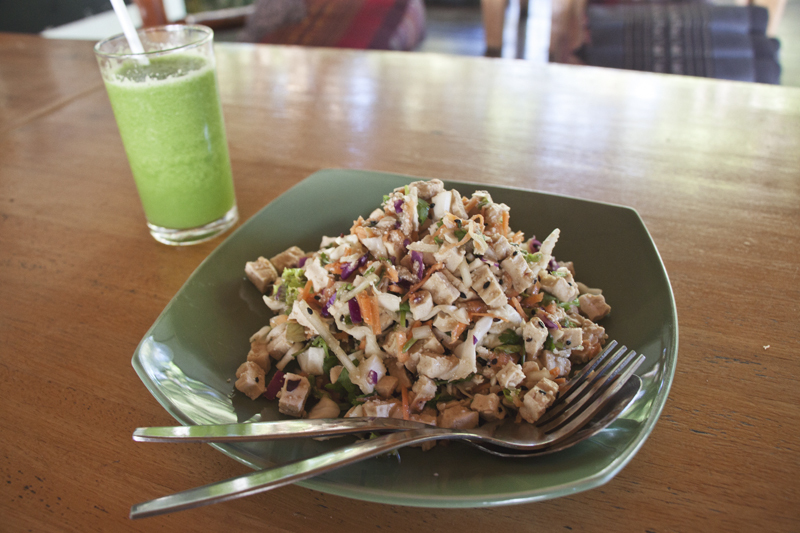 Fill your boots with salads and morning glory and fruits and vegs. One of my favourite lunch spots on the island. They also have a great smoothie and juice menu and some kombucha. Great social vibe too. This restaurant hasn’t always been open when I visited in the past, but it was this time around, so yay! Formerly EFE Natural Macrobiotic Kitchen, this restaurant is now called Akasha. 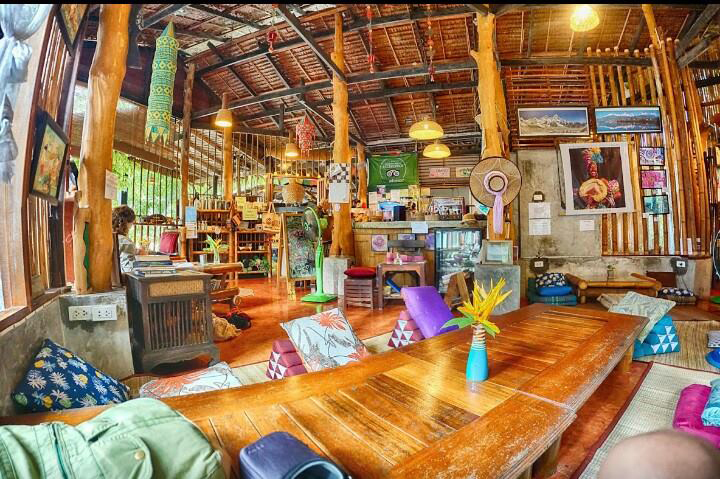 This was my favourite restaurant in Koh Phangan when I visited the first time. Super healthy, clean, mostly organic simple food; red rice, lots of steamed veggies, very little seasoning (in a good way) a good selection of beans and legumes, macro bowls, soups and sandwiches (amazing bread! ).They cold press their own sunflower and coconut oils and have a great selection of packaged spices, teas, seeds, homemade snacks and natural health products for sale. Homemade, organic, cruelty-free, plant-based, gluten-free, vegan, delicious, and tragically overpriced. I had the Malibu sushi made with organic quinoa, beet root and raw veggies drizzled with tahini wasabi and fermented ginger, sparkling coconut lime elixir and funky monkey banana split. It was tiny, but it was delicious. It’s a lovely place, if you can afford it. A huge sunny and comfy terrace where I loved working and lazing around with a book and a fruity drink, Big Mountain also has a huge selection of vegan food and drinks, both for breakfast lunch and dinner. Everything marked with a green V is vegan and there so much on offer! From vegan breakfast with tempeh and soy bacon (my pick! ), to veggie burgers, to gyros, burrito, pizza, and pasta, you’ll be served well for all vegan western food cravings at Blue Mountain. But that’s really not all, there’s also a huge menu of vegan asia food that I didn’t unfortunately get to try but that sounded amazing (grilled tempeh and veggie with tamarind, stir fried veggies and ginger, morning glory with garlic and chili, pineapple cashew fried rice, etc). Hey, but that’s not. There’s also a huge menu of healthy and original juices, drinks, smoothies and mocktail I haven’t seen anywhere else on the island. Apple cider, ginger, lemon, cinnamon, star anise cocktail anyone? 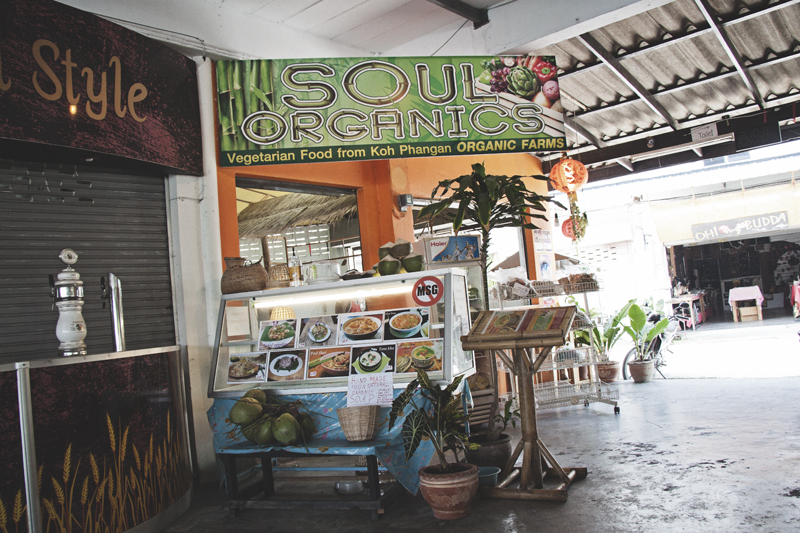 Nestled at the back of the popular Phantip Market next to the 7 Eleven in Thong Sala, Soul Organics has a short menu of veganized Thai dishes prepared with care and organic ingredients from the family’s local farm. 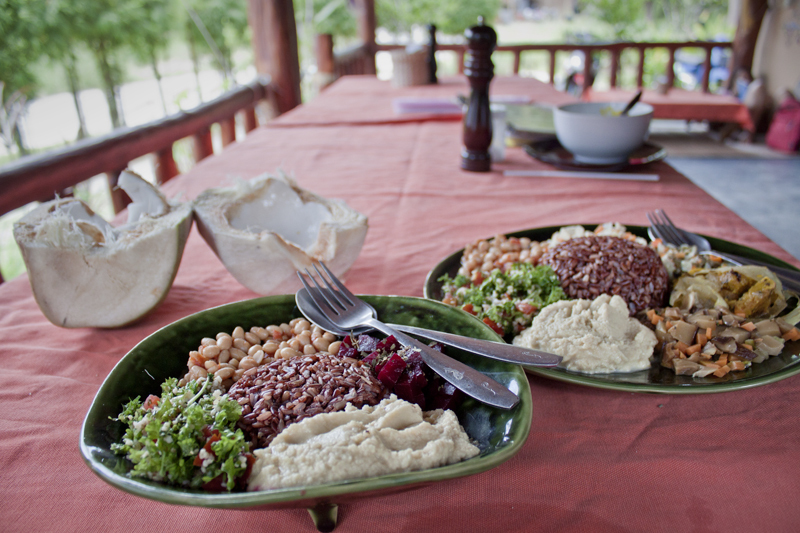 Dishes are served with brown rice and are very affordable for organic dishes. Located within the controversial Agama Yoga (which I really wanted to experience just for the sake of seeing what all the fuss is about, but I ran out of time! 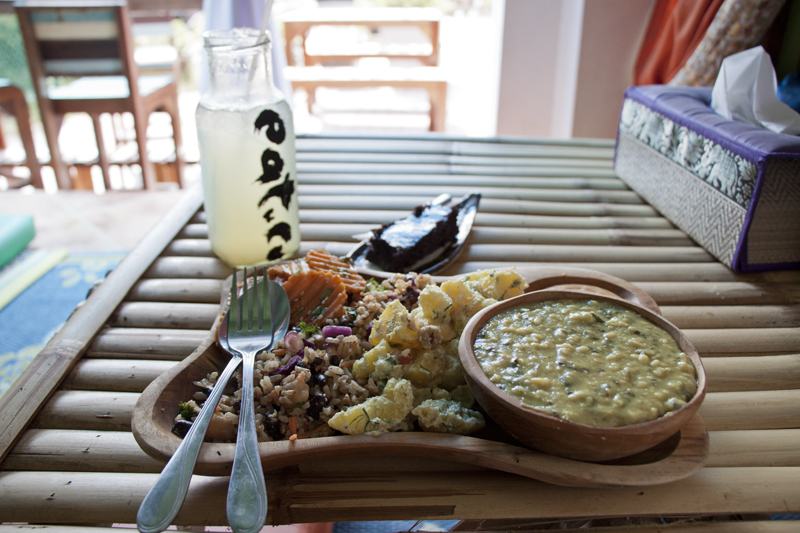 ), this restaurant serves a simple vegetarian menu with good prices relative to the rest of the island. 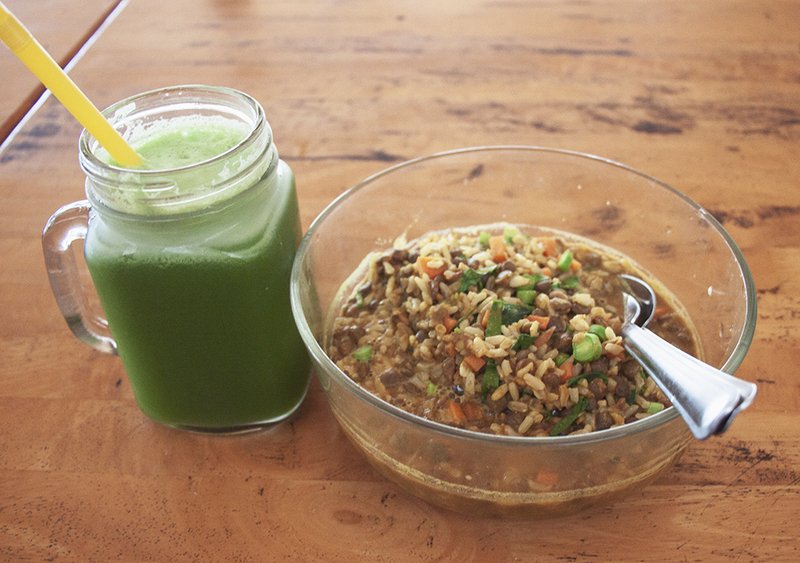 Several vegan options, bowls, curries, kitchari and many nice green juices, smoothies and elixir. Food was served by a rather grumpy lady. I ordered the veggie wrap, but was instead told to have the hummus citrus wrap. The presentation was a bit meh, but the wrap was really delicious. 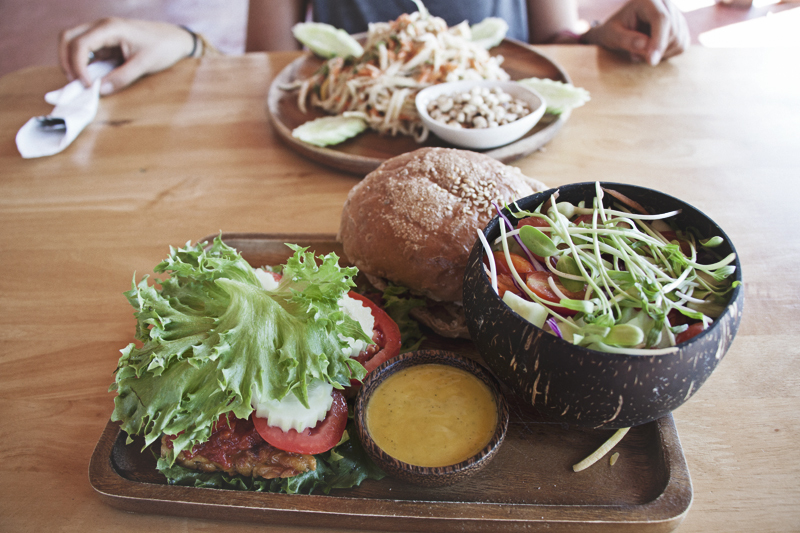 They have a small selection of light meals that are mostly vegan such as a sweet potato burger, fresh pad thai, a few wraps, falafel, sandwiches and salads as well as a short menu of healthy smoothies and kombucha. Lovely beachfront restaurant located inside Ananda Wellness resort, try to come at sunset. Several vegan options clearly identified such as tofu laarb (a delicious warm salad of tofu, veggies and pounded rice full of coriander and lime juice), dark lentil and ginger soup, veggie burgers, curries, pasta, vegetables cooked in a manners and a couple of vegan chocolate sweets. Great juice menu. Sells nice organic fruits and vegetables (the best durian on the island! ), coconut oil, seeds and grains, eco cosmetics, kombucha and kefir, raw vegan desserts and a few other vegan and vegetarian light bites. Same as above. Srithanu location. Try their vegan coconut yoghurt, it’s incredible! Kitchenware and natural ingredient shop. They have the best deal on organic cold pressed coconut oil on the whole island and frozen tempeh. A bunch of other interesting things also, definitely worth the detour. Wow! everything looks so good!! I’m not a vegan, but wow these places look delicious! And who can say no to chocolate!? Thanks for all the directions too! I’ll have to refer to this if we go to Koh Phangan. Everything looks totally delicious and has made me very hungry. 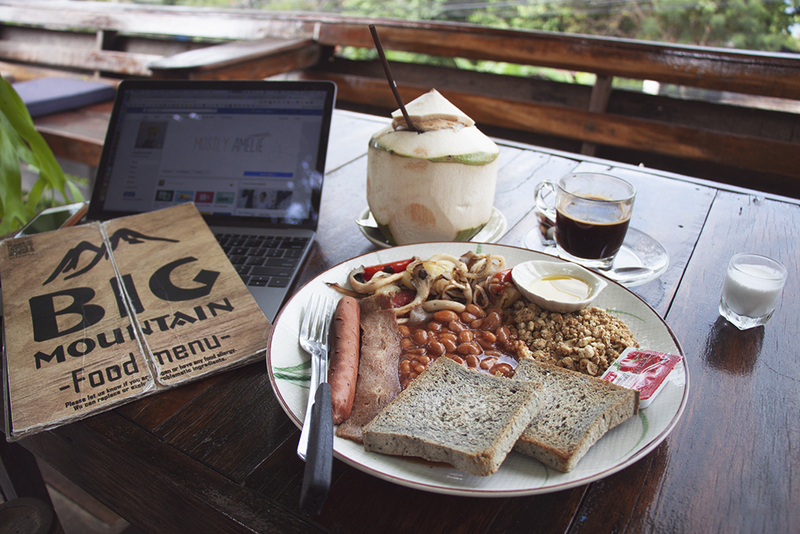 I haven’t been to Koh Phangan but now I know where to eat. Not a vegan, but these looks something I would definitely order! A lot of these would be great post detox meals though! I’m not a vegan but these places look like they have winners! Thanks! So many great options! I love that there’s somewhere to get great vegan chocolate, that’s definitely been the most challenging thing to find in Asia, and I could totally go for some of the salt truffle right now. Super informative post! I’d love to try some of these even though I’m not vegan because the food just looks great. The food looks great, vegan or not, but for me it’s a shame so many of them appear to be quite Westernised. 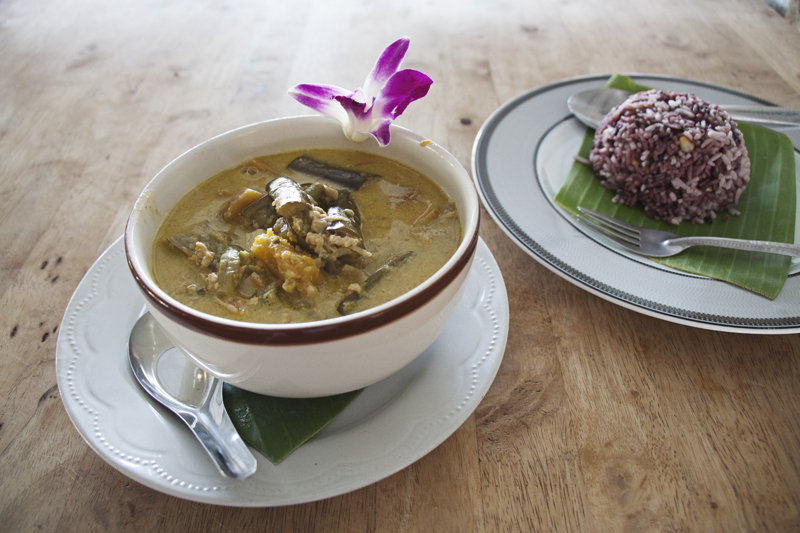 Personally, part of the joy of travel is eating traditional local dishes. 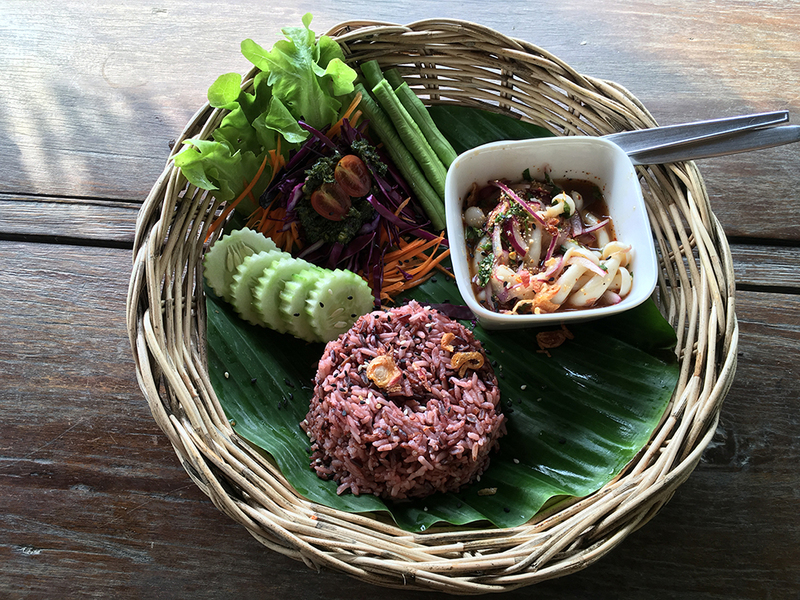 Is there no vegetarian tradition in Koh Phangan? Hey Fiona! Yeah, for sure a lot of these places are quite westernized. I guess Thai people are not so much into vegan food and the restaurant feel like they have to cater to the westerners’ tastes. A lot of the restaurants I visited did offer a few veganized Thai options however, and it’s possibly the fact that I have been in South East Asia for two years and was excited to see something else than a curry that makes it look like there isn’t much local stuff on offer. There is a little! Thanks, this is super awesome. I plan on visiting Koh Phangan later this year. Do you have any advice on where to stay on the island to have the best access to the vegan restaurants without being overcrowded by party goers? 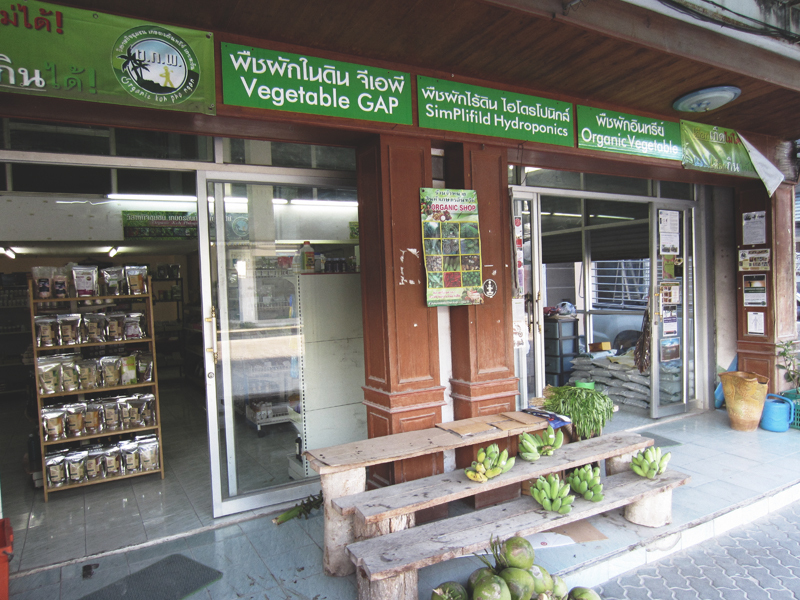 there’s also a “new” vegan restaurant right next to “soul organics” at the food market in thong sala: CAPANA. Lovely couple running this place with delicious homemade, vegan food. Specality: their turmeric wraps ?? you made such a perfect work writing down all these information. I am going to stay in KPG for 5 days and I will try to taste everything you mentioned. be vegan in Asia has never been so simple and delicious. 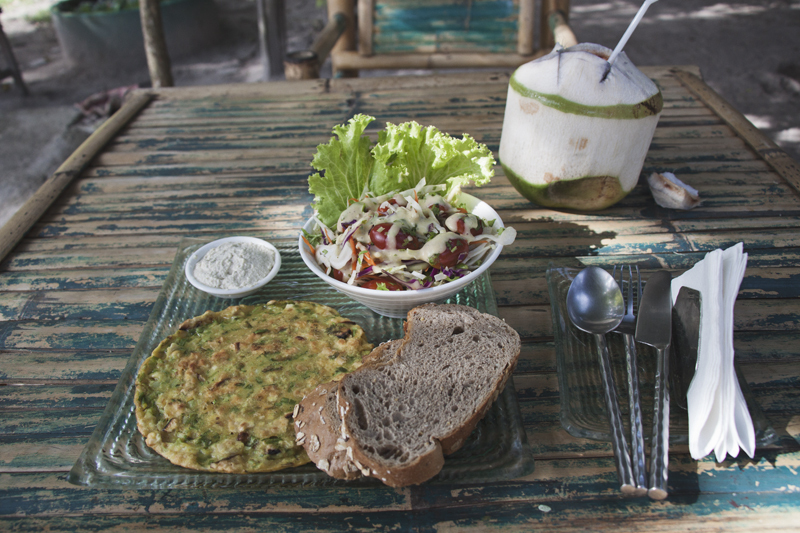 Love that there are lots of vegan restaurants to choose from in Koh Pangan. I’ve been to a couple of them already and I hope I can get to visit the rest when I come back on the latter part of the year. I’ve been hearing lots of positive feedback from these restaurants that’s why I’m too stoked to try their menu. we’ll be doing Koh Phangan for 5 weeks Yay!. would you know if it is easy to buy dried chickpeas, lentils and the like? Also, have you seen Celery sold at the markets. (we’re into juicing it). Thank you for your posts on KP, really helping me plan our trip.